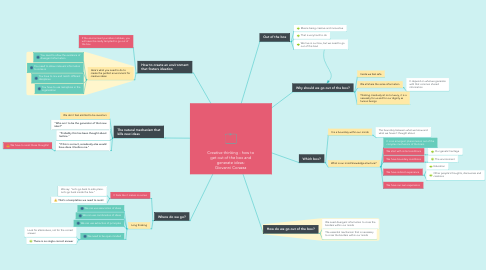 This mind map summarizes the key takeaways from the TEDx Talk "Creative thinking - how to get out of the box and generate ideas" by Giovanni Corazza. 1.2. "Who am I to be the generator of that new idea?" 1.3. "Probably this has been thought about before." 1.4. "If this is correct, somebody else would have done it before me." 1.4.1. We have to resist these thoughts! 2. Why should we go out of the box? 3.3. We live in our box, but we need to go out of this box! 4.1.1. The boundary between what we know and what we haven't thought about. 4.2. What is our mind/knowledge structure? 4.2.1. It is an emergent phenomenon out of the complex mechanism of the brain. 5. How do we go out of the box? 7.1.1. We say: "Let's go back to safe place. Let's go back inside the box."